Buy a $2.50 cupcake at Cupcake Royale and twenty-five cents of that cost goes toward health care for Jody Hall’s employees. That’s a big bite, says Hall, who pays as much for health care as she does for rent at her four Seattle locations. But Hall believes insuring her bakeshop employees (nearly 70 at last count) is a benefit she’s duty-bound to offer. Hall was recently at the White House promoting a plan to lower heath care costs, increase choices for small-business owners and help guarantee coverage for all. It’s why she’s a member of the Washington Can! 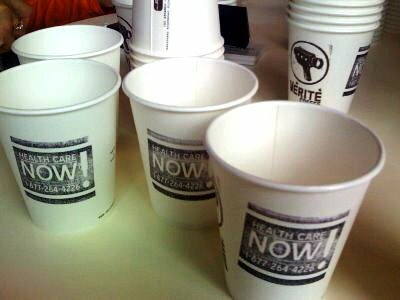 — a coalition of Small Business for Secure Health Care, and why she’s urging coffee-shop owners locally and nationwide to stamp their coffee cups with a toll-free number to Congress (877-264-4226) — an effort to encourage customers to call in support of a public option for health care. Hall was profiled today on National Public Radio — telling the nation her story on NPR’s Morning Edition. Listen to what she has to say right here. 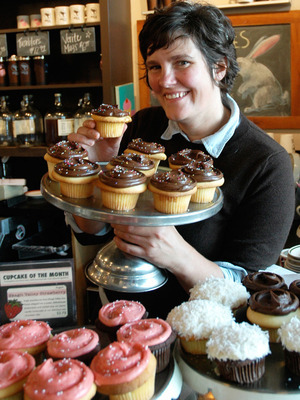 Whether you’re in agreement or not, I urge you to support your local cupcake maven, whose company motto — “Legalize Frostitution!” — is a rallying cry we can all get our hands around.